Recognia has detected a "Triple Moving Average Crossover" chart pattern formed on iShares Russell 2000 ETF (IWM:NYSE). 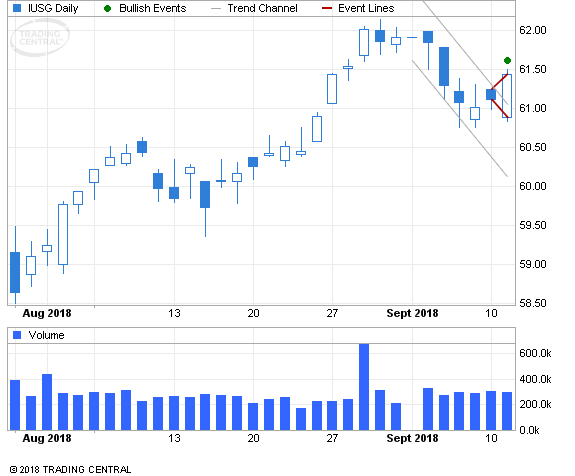 This bullish signal indicates that the stock price may rise from the close of $147.52. Recognia has detected an "Outside Bar (Bearish)" chart pattern formed on VANGUARD REIT ETF (VNQ:NYSE). This bearish signal indicates that the stock price may fall from the close of $81.20. Recognia has detected a "Price Crosses Moving Average" chart pattern formed on VANGUARD MEGA CAP VALUE ETF (MGV:NYSE). This bearish signal indicates that the stock price may fall from the close of $76.92. Recognia has detected a "Triple Moving Average Crossover" chart pattern formed on Invesco KBW Bank ETF (KBWB:NASDAQ). 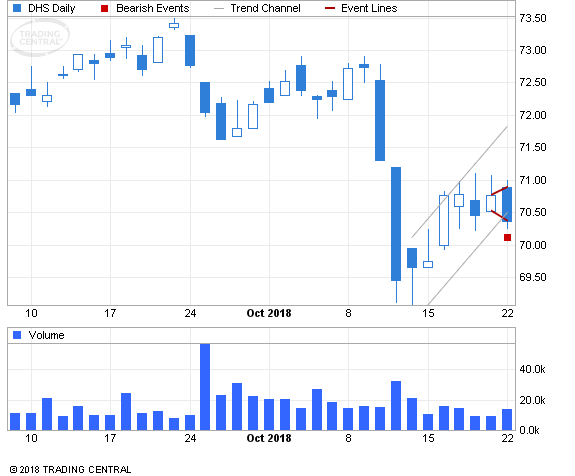 This bearish signal indicates that the stock price may fall from the close of $49.33. Recognia has detected a "Hammer" chart pattern formed on iShares Russell 1000 Value ETF (IWD:NYSE). This bullish signal indicates that the stock price may rise from the close of $120.46. Recognia has detected a "Hammer" chart pattern formed on iShares Edge MSCI Min Vol USA ETF (USMV:NYSE). This bullish signal indicates that the stock price may rise from the close of $55.95. Recognia has detected a "Price Crosses Moving Average" chart pattern formed on iShares Edge MSCI Min Vol Global ETF (ACWV:NYSE). This bullish signal indicates that the stock price may rise from the close of $84.92. Recognia has detected a "Downside Breakout" chart pattern formed on Invesco S&P MidCap 400 Pure Growth ETF (RFG:NYSE). This bearish signal indicates that the stock price may fall from the close of $140.99 to the range of $127.00 - $130.00. The pattern formed over 31 days which is roughly the period of time in which the target price range may be achieved, according to standard principles of technical analysis. Recognia has detected a "Double Moving Average Crossover" chart pattern formed on VANGUARD CONSUMER STAPLES ETF (VDC:NYSE). 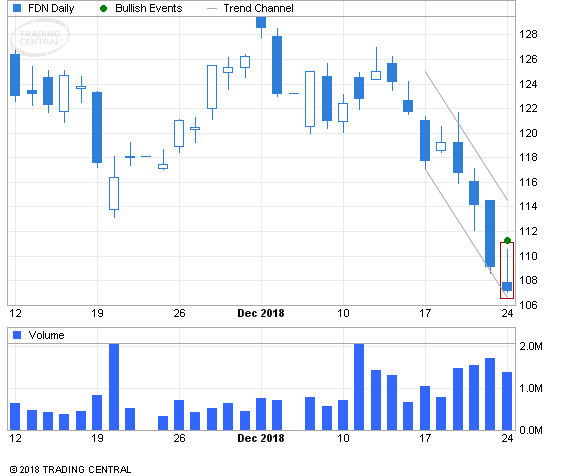 This bearish signal indicates that the stock price may fall from the close of $134.58. Recognia has detected a "Double Moving Average Crossover" chart pattern formed on iShares Edge MSCI Min Vol Global ETF (ACWV:NYSE). This bearish signal indicates that the stock price may fall from the close of $82.07. Recognia has detected a "Price Crosses Moving Average" chart pattern formed on iShares Edge MSCI Min Vol Emerging Markets ETF (EEMV:NYSE). This bearish signal indicates that the stock price may fall from the close of $55.69. Recognia has detected a "Price Crosses Moving Average" chart pattern formed on iShares Residential Real Estate Capped ETF (REZ:NYSE). This bullish signal indicates that the stock price may rise from the close of $64.38. Recognia has detected a "Price Crosses Moving Average" chart pattern formed on SPDR Portfolio Short Term Corporate Bond ETF (SPSB:NYSE). This bullish signal indicates that the stock price may rise from the close of $30.14. Recognia has detected an "Inside Bar (Bullish)" chart pattern formed on Columbia Beyond BRICs ETF (BBRC:NYSE). This bullish signal indicates that the stock price may rise from the close of $16.57. Recognia has detected an "Inverted Hammer" chart pattern formed on FIRST TRUST DOW JONES INTERNET INDEX FUND ETF (FDN:NYSE). This bullish signal indicates that the stock price may rise from the close of $107.21. Recognia has detected an "Inverted Hammer" chart pattern formed on ISHARES U.S. OIL EQUIPMENT & SERVICES ETF (IEZ:NYSE). This bullish signal indicates that the stock price may rise from the close of $19.30. Recognia has detected a "Double Moving Average Crossover" chart pattern formed on Aberdeen Standard Silver Trust (SIVR:NYSE). This bullish signal indicates that the stock price may rise from the close of $14.37. Recognia has detected a "Price Crosses Moving Average" chart pattern formed on Invesco National AMT-Free Municipal Bond ETFo (PZA:NYSE). This bearish signal indicates that the stock price may fall from the close of $24.94. Recognia has detected a "Price Crosses Moving Average" chart pattern formed on VANGUARD UTILITIES ETF (VPU:NYSE). This bearish signal indicates that the stock price may fall from the close of $114.71. Recognia has detected a "Double Moving Average Crossover" chart pattern formed on SPDR S&P International Dividend ETF (DWX:NYSE). This bearish signal indicates that the stock price may fall from the close of $33.98. Recognia has detected a "Flag (Bullish)" chart pattern formed on Rexford Industrial Realty Inc (REXR:NYSE). This bullish signal indicates that the stock price may rise from the close of $35.68 to the range of $37.70 - $38.20. The pattern formed over 5 days which is roughly the period of time in which the target price range may be achieved, according to standard principles of technical analysis. The price seems to be resuming a sharp rally after taking a brief pause. A bullish Flag pattern occurs during a dynamic market rally, representing a brief pause as the market "catches its breath" before running off again in the same direction. The pattern consists of two parallel trend lines, often sloping downward against the prevailing uptrend, and is confirmed when the price breaks through the upper boundary to resume the rise. Recognia has detected an "Upside Breakout" chart pattern formed on Stag Industrial Inc (STAG:NYSE). This bullish signal indicates that the stock price may rise from the close of $29.34 to the range of $34.50 - $35.75. The pattern formed over 401 days which is roughly the period of time in which the target price range may be achieved, according to standard principles of technical analysis. The price broke upward out of a trading range suggesting we're entering a new uptrend. The Upside Breakout pattern represents a trading range in which prices move sideways between two parallel horizontal lines. It's often a pause or congestion area within an existing trend though sometimes the breakout results in a reversal to the prior trend. Either way, an upside breakout through the upper resistance line signals an end to the consolidation period and the start of an uptrend. Recognia has detected a "Symmetrical Continuation Triangle (Bullish)" chart pattern formed on Intercontinental Exchange Inc (ICE:NYSE). This bullish signal indicates that the stock price may rise from the close of $73.99 to the range of $79.25 - $80.50. The pattern formed over 17 days which is roughly the period of time in which the target price range may be achieved, according to standard principles of technical analysis. Tells Me: The price has broken upward out of a consolidation period, suggesting a continuation of the prior uptrend. A Symmetrical Continuation Triangle (Bullish) shows two converging trendlines as prices reach lower highs and higher lows. Volume diminishes as the price swings back and forth between an increasingly narrow range reflecting uncertainty in the market direction. Then well before the triangle reaches its apex, the price breaks out above the upper trendline with a noticeable increase in volume, confirming the pattern as a continuation of the prior uptrend. Recognia has detected a "Flag (Bearish)" chart pattern formed on CoStar Group Inc (CSGP:NASDAQ). This bearish signal indicates that the stock price may fall from the close of $463.94 to the range of $427.00 - $434.00. The pattern formed over 13 days which is roughly the period of time in which the target price range may be achieved, according to standard principles of technical analysis. 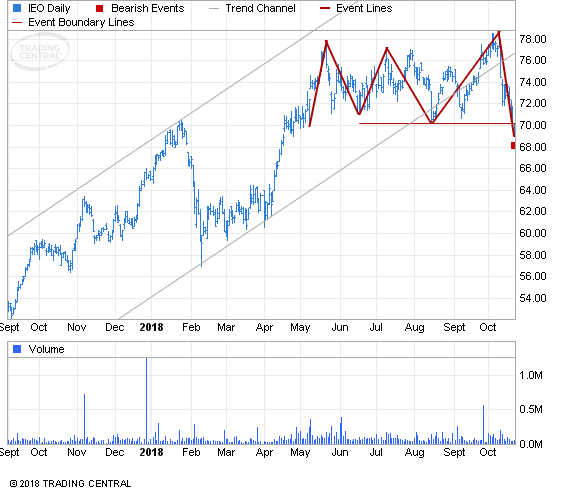 Recognia has detected a "Continuation Diamond (Bearish)" chart pattern formed on Sienna Biopharmaceuticals Inc (SNNA:NASDAQ). This bearish signal indicates that the stock price may fall from the close of $2.43 to the range of $1.10 - $1.40. The pattern formed over 54 days which is roughly the period of time in which the target price range may be achieved, according to standard principles of technical analysis. Tells Me: The price has broken downward out of a consolidation period, suggesting a continuation of the prior downtrend. The Continuation Diamond (Bearish) begins during a downtrend as prices create higher highs and lower lows in a broadening pattern. Then the trading range gradually narrows after the highs peak and the lows start trending upward. When the price breaks downward out of the diamonds boundary lines, it marks the resumption of the prior downtrend. Recognia has detected a "Continuation Wedge (Bearish)" chart pattern formed on First Solar Inc (FSLR:NASDAQ). This bearish signal indicates that the stock price may fall from the close of $50.92 to the range of $33.00 - $36.00. The pattern formed over 64 days which is roughly the period of time in which the target price range may be achieved, according to standard principles of technical analysis. Tells Me: After a temporary interruption, the prior downtrend is set to continue. A Continuation Wedge (Bearish) represents a temporary interruption to a downtrend, taking the shape of two converging trendlines both slanted upward against the trend. During this time the bulls attempt to win over the bears, but in the end the bears triumph as the break below the lower trendline signals a continuation of the prior downtrend. Recognia has detected a "Symmetrical Continuation Triangle (Bullish)" chart pattern formed on Steven Madden Ltd (SHOO:NASDAQ). 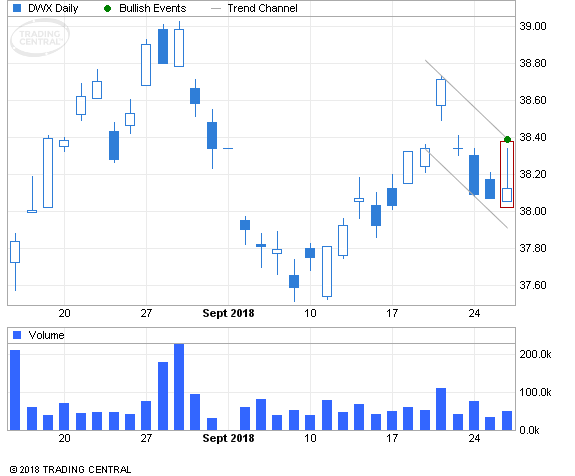 This bullish signal indicates that the stock price may rise from the close of $33.54 to the range of $36.30 - $37.00. The pattern formed over 20 days which is roughly the period of time in which the target price range may be achieved, according to standard principles of technical analysis. Recognia has detected a "Flag (Bearish)" chart pattern formed on Macrogenics Inc (MGNX:NASDAQ). This bearish signal indicates that the stock price may fall from the close of $18.65 to the range of $16.90 - $17.30. The pattern formed over 6 days which is roughly the period of time in which the target price range may be achieved, according to standard principles of technical analysis.